If you have ever looked up at the night sky and wondered what that particular shinning dot is, you don’t need to look any further than your iPad for the answer. 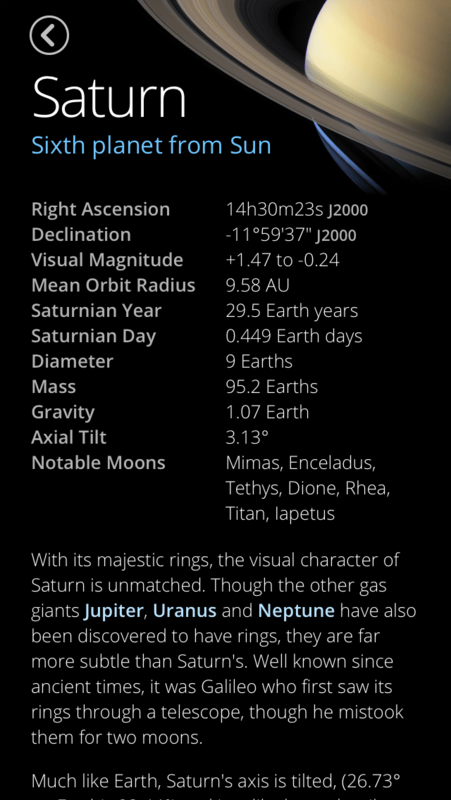 There are a plethora of choices for planetarium software on iPhone and iPad. Now, there’s a new app called Sky Guide. What differentiates Sky Guide from most personal planetarium Apps is that the sky images are actual photographs rather than vector simulations. This started with a project by Nick Risinger to photograph a full panoramic sky survey. You may be familiar with a previous app that Nick created in partnership with R&D Arts called Sky Survey. If Sky Guide looks familiar, that’s because it’s the successor to this previous App, this time developed in partnership with Chris Laurel, probably best known for his Mac and iOS app Cosmographia. Nick and Chris formed a new partnership, Fifth Star Labs, and Sky Guide is the first product of their collaboration. I looked at the original Sky Survey App some months ago. To be honest, I found it a bit incomplete. The gyro motion was shaky, and the included information on objects was a bit light. I also wasn’t particularly impressed with the depth of the sky imagery. I’m happy to say that with the work of Fifth Star Labs, Sky Guide has addressed pretty much all of these faults in the original App. The interface of Sky Guide will clearly be familiar to anyone who has used Sky Survey, but it’s now a more refined experience. The gyro motion is smoother, and the settings and selection behavior and appearance feel much more natural. Panning around the sky is now easier in the new app, it could be disorienting in the original. The depth of field has also been improved, allowing you to use the pinch zoom gesture to look a little deeper into the sky. All of these changes add up to an experience that better immerses you in the stars. One feature that Sky Guide is still missing is a time control. Currently the app will only show you the current sky, which doesn’t allow you to look ahead during the day to what your actual night sky will be. Hopefully this feature will be added in a future release. Sky Guide also doesn’t quite work for telescope users looking for deep sky objects. You can in fact search for most Messier and many NGC objects and the app will pinpoint them for you, however for the more distant objects, because this is photographic, you won’t be able to zoom far enough in to see any real sense of the object’s shape. When I have the telescope out hunting galaxies and nebula, Star Walk remains my go-to choice. Sky Guide is however a great choice for casual stargazing, whether you’re out in the back yard or comfortably inside on your couch. Sky Guide is a great way to learn some of the constellations and enjoy their mythological stories. Turn the lights out, and uncheck the options in Sky Guide for showing the star and constellations labels. Then sit back and look up at the Milky Way as most of us can no longer see it from all the light pollution. It may not be the real night sky, but the immersive photographic experience in Sky Guide is probably about the closest many people can easily get to seeing the Milky Way for themselves. Highly immersive and enjoyable way to explore the stars. Photographic source material instead of a vector sky simulation. No time control to see what the sky will look like throughout the day. Better options available for exploring Messier and NGC objects. 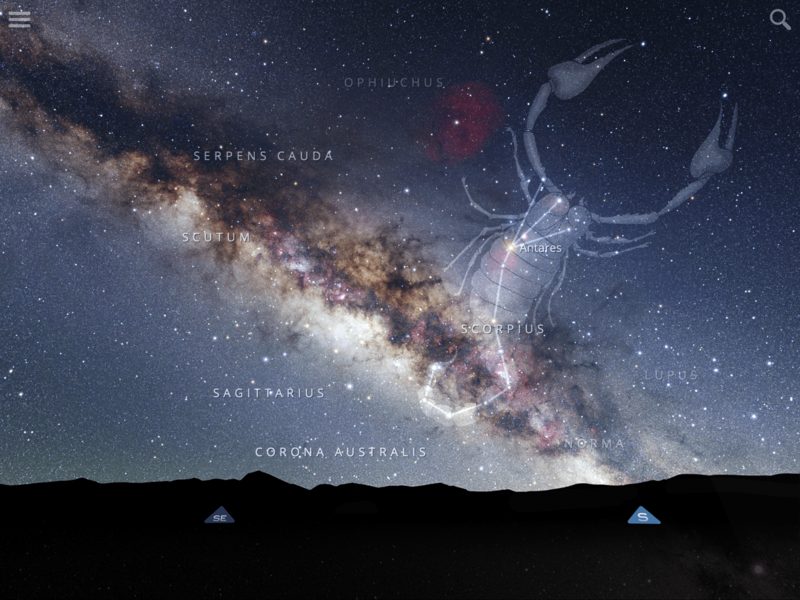 Sky Guide is a great compliment to the sky simulation based Apps like Star Walk. Each has it’s strengths. With Sky Guide, that comes in the form of an experience that is more immersive than most, and is based on real night sky photography. It is well worth checking out.